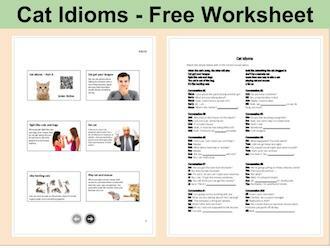 Learn some idioms about cat. Jen: What happened? You look awful? Tom: I did not go home last night. Jen: You stayed out all night and came to work? Tom: Yeah, and I am so tired. Jen: You look it. You look like something the cat dragged in. 7) There's more than one way to skin a cat! Jen: Did you get the loan from the bank? Al: No, they turned me down. Jen: I’m sorry. So you can”t open your business. Al: No, I can. I”ll get the money somehow. Jen: Yeah!, You still think you can get the money? Al: Sure. There’s more than one way to skin a cat. Sue: We’re going surfing on Friday. Wanna come? Tim: That sounds cool but …. Tim: Well, I’m afraid of sharks. Sue: Oh, don”t be a scaredy-cat. It’s totally safe. Tim: No thanks. I’m petrified of sharks. Mel: I am going to miss working with Joe. Sal: What are you talking about? He’s leaving? Mel: Um, The company is firing ten people. Sal: What? Who told you that? Mel: Oh no, I was not supposed to tell anyone. Sal: Too late. The cat is out of the bag. Jill: How is your new boss? Ken: Terrible. He is a poor manager. Jill: Really why is that? Ken: He is never there so we never do any work. Everyone just goofs off all day. Jill: Well, when the cat’s away, the mice will play. When you look like something that cat dragged in, you have a very poor appearance. This phrase refers to cats bringing in dead animals to show to their owners. This phrase means that there is more than one way to do something. When you skin an animal, you remove its skin or fur. A scaredy cat is a person who gets frightened easily. We call a person a scaredy cat when we think they are being too timid to try something. When you let the cat out of the bag, you accidentally reveal something that was supposed to be a secret. Once you say it, it is no longer a secret. This phrase refers to how mice will not come out when a cat is around. It means that people are not working because their boss or person of authority is not there. Don't be a scaredy . Look what the cat in. When the cat is away the mice will . There is more than one way to a cat. The cat is out of the .